1) Though Google responded in a significant way at this year's CES, Amazon still leads in the voice control competition—if a vendor was announcing voice capability this year, it was likely with Alexa. Google's response did move them into second place, passing Apple, who had more third-party products with HomeKit support but nearly as much more as were labeled with Google Assistant. 2) The disconnect between televisions shown at CES and the televisions people are buying seems to be growing. Putting aside Samsung's "The Wall" and LG's rollable OLED, the fact that every TV manufacturer was showing 8K televisions seemed like a way to discourage folks who are on the edge of making a 4K decision. If I were these companies, I'd be worried about what I might be doing to unsettle my market further. 3) Speaking of disconnects, the separation between the likely futures of transportation and the reality of selling automobiles right now has rarely been more apparent. 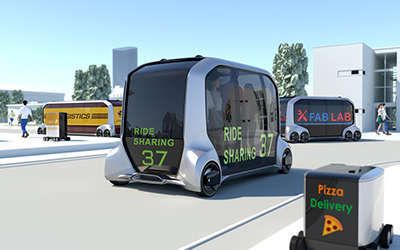 A good example was Akido Toyoda's introduction of the e-Palette transportation concept (shown above) at the same time that advertisements for the brand-new 2018 Toyota Camry sell performance. Toyota isn't the only one—Ford had another jarring juxtaposition this year, which was accentuated by James Hackett's keynote. 4) One of the things that is always interesting about CES is seeing vendors who aren't making the same stuff that everybody else makes. A salient example from this year was LaCrosse Technology who makes weather stations and exceptionally good-looking atomic clocks. We'll be reviewing one of their new wireless weather stations soon. 5) Old brands never die: I saw Atari, RCA, Sansui, Studebaker, and Victrola on the show floor. Retro is always with us, too: there were many new turntables (including yet another high-end example from Technics), new eighties-style boomboxes (many with Bluetooth, of course), and Kodak is introducing a new Super 8 camera. More analysis and reviews coming soon!